Why is World Health Organisation not releasing Iraq birth defects report? What’s delaying the WHO report on Iraqi birth defects http://www.aljazeera.com/indepth/opinion/2013/06/201365101540408281.html A 2012 World Health Organization study on congenital birth defects in Iraq has still not been released to the public. 06 Jun 2013 Mozhgan Savabieasfahani Dr Mozhgan Savabieasfahani, a native of Iran, is an environmental toxicologist based in Michigan. She is the author of over two dozen peer reviewed articles and the book, Pollution and Reproductive Damage (DVM 2009). Iraq is poisoned. Thirty-five million Iraqis wake up every morning to a living nightmare of childhood cancers, adult cancers and birth defects. Familial cancers, cluster cancers and multiple cancers in the same individual have become frequent in Iraq. Sterility, repeated miscarriages, stillbirths and severe birth defects – some never described in any medical books – are all around, in increasing numbers. Trapped in this hellish nightmare, millions of Iraqis struggle to survive, and they and they call for help. San Onofre is Dead & So is Nuclear Power, Nukefree.org, Harvey Wasserman, 7 June 13 From his California beach house at San Clemente, Richard Nixon once watched three reactors rise at nearby San Onofre. As of June 7, 2013, all three are permanently shut. It’s a monumental victory for grassroots activism. it marks an epic transition in how we get our energy…… In the early 2000s, Units 2 & 3 needed new steam generators of their own. In the usual grasp for more profits, Edison chose untested, unlicensed new designs. Make no mistake—this double victory at San Onofre is a falling domino. 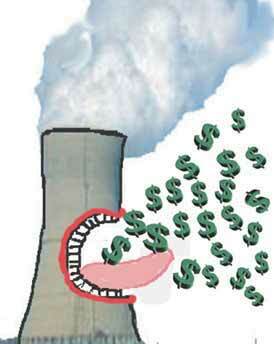 Had the public not fought back, those reactors would have been “fixed” at public expense. Southern California Edison’s announcement this week that it will close its troubled twin-reactor San Onofre nuclear power plant—along with other recent setbacks for atomic energy in the United States—marks a downward spiral for nuclear power. 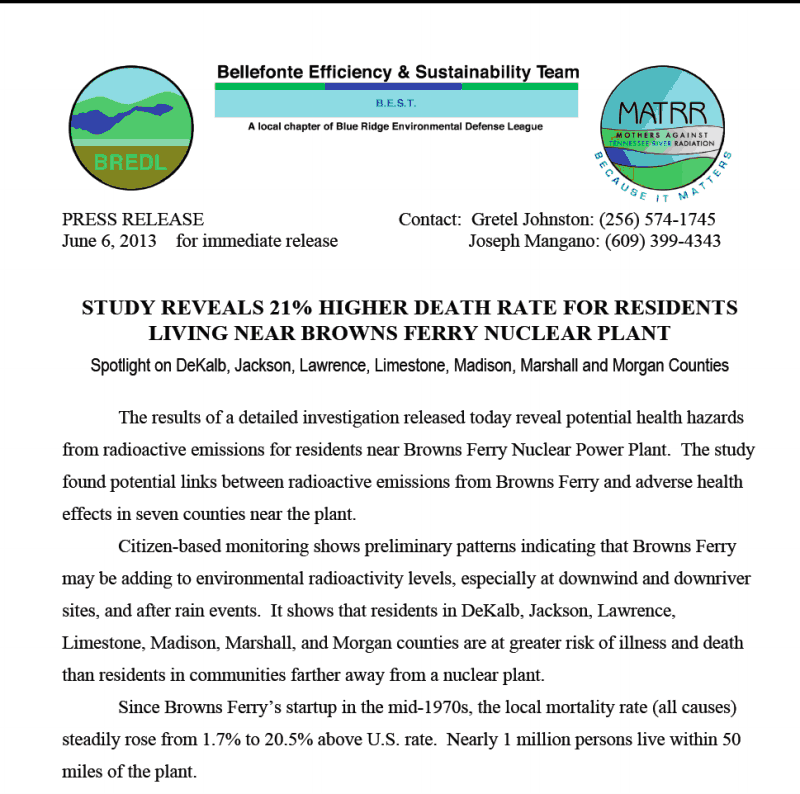 opponents of the plant acknowledged that questions remain regarding what will happen to radioactive waste generated by the site and to the region’s energy needs. Using a cane and wearing a hat reading “Peace No Nukes,” 85-year-old Lyn Harris Hicks shuffled to the front gates of the San Onofre nuclear power plant on Friday to celebrate a utility company’s decision to close the seaside facility for good. New research is under way on the alarming increase in birth defects in the Iraqi city of Fallujah, showing elevated levels of radioactivity in the city and across the country. Iraqi doctors have long reported a spike of cases involving severe birth defects in Fallujah since 2004 which are shocking in their severity. So is the US being honest about the weapons it used in the 2004 battle for the city, and in its other theatres of war? Guests: Ross Caputi, Dai Williams, Raed Jarrar. America’s “Secret Fukushima”: Uranium Mining is Poisoning the Bread Basket of the World By Margaret Flowers and Kevin Zeese Global Research, June 07, 2013 Truthout Early in the morning of July 16, 1979, a 20-foot section of the earthen dam blocking the waste pool for the Church Rock Uranium Mill caved in and released 95 million gallons of highly acidic fluid containing 1,100 tons of radioactive material. The fluid and waste flowed into the nearby Puerco River, traveling 80 miles downstream, leaving toxic puddles and backing up local sewers along the way. 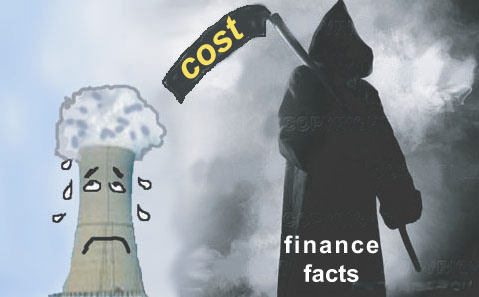 U.S. plants covered under the directive are older, boiling-water reactors mainly similar in design to the Fukushima facility…..
Plant operators may have to spend nearly $3.6 billion over the next three to five years on modifications to the nation’s 102 nuclear facilities in response to the Fukushima accident, according to a Platts survey released on Thursday. U.S. orders new safety upgrades at nuclear plants By CNN Staff June 7, 2013 –– Washington — U.S. regulators are directing 31 nuclear reactors similar in design to the Fukushima Daiichi plant in Japan, where an earthquake and tsunami caused a meltdown two years ago, to take additional steps to help contain radiation and other damage from any accident that is not quickly halted. The Nuclear Regulatory Commission directive on Thursday requires enhancements to systems for venting accumulated pressure from containment structures during an emergency. Vents must also be able to safely handle rising temperatures, hydrogen concentrations and radiation levels. California nuclear plant to shut: a case of unforgiving nuclear economics, Christian Science Monitor, Peter Spotts, 7 June 13 Southern California Edison is shutting the remaining two reactors at San Onofre, citing high repair costs and an NRC ruling that the utility says would delay reactor restarts. The San Onofre Nuclear Generating Station (SONGS), a nuclear power plant set into the seaside bluffs in northern San Diego County, is closing after the high cost of repairs and a Nuclear Regulatory Commission board ruling prompted its owner, Southern California Edison, to pull the plug on the 45-year-old facility.The announcement Friday that San Onofre’s two functioning reactors were being shut down brings to four the number of reactors that nuclear utilities have slated for closure since last November. Meanwhile, nuclear utilities have three new reactors on the drawing boards. At least for now, “we’re losing them faster than we’re building them,” quips David Lochbaum, a nuclear engineer by training who focuses on nuclear-energy issues at the Union of Concerned Scientists in Washington…..
n early May, the utility Dominion shuttered its single-reactor Kewaunee nuclear plant in Carleton, Wis., a casualty of cheaper sources of electricity and an inability to build additional reactors to take advantage of what the company called economies of scale. Financial setbacks can take their toll as well, he says, whether a setback comes from lost business or from hardware failures or human error that sets the stage for costly repairs……..
“……..Thousands of open uranium mines excavated beginning in the 1950s continues to release radiation today. There have been inadequate measurements but the limited measures done show ongoing leaks larger than Fukushima. How did we get here? Nathaniel White-Joyal, Host: It’s clear that the west coast of the United States will be affected by the radiation from the Fukushima Daiichi nuclear plant. Akio Matsumura, Diplomat: Let me clarify. We are facing global disaster — catastrophe — occurring. From that perspective, over 40 years, 50 years, or maybe 100 years. We cannot escape from this fact. For that we have to keep in mind. 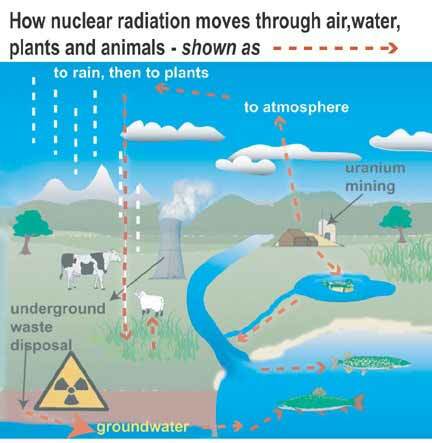 […] This radioactive material, or contaminated water, any cases, reach out to your west coast as well. If you are counting on Japan, I can assure you now they do not take serious action. Spot Uranium Falls Below $40/Pound Benchmark for First Time in Four Years http://uraniuminvestingnews.com/14766/spot-uranium-falls-below-40pound-benchmark-for-first-time-in-four-years.html June 7, 2013,The West Australian reported that spot uranium prices fell to below $40/pound for the first time since August 2009, placing pressure on uranium explorers. A hearty increase in the spot price is needed to force WA’s fledgling uranium sector into first gear, with Canadian giant Cameco indicating a price of more than $70/lb is needed before it can give the green light to its massive Yeelirrie or Kintyre deposits. Hollande is on a three-day visit to Tokyo accompanied by several cabinet ministers and more than 30 executives, including the head of France’s nuclear energy giant Areva, Luc Oursel. Iranian Candidates Quarrel Over Nuclear Talks By ALI AKBAR DAREINI Associated Press TEHRAN, Iran June 7, 2013 (AP) Iran’s eight presidential candidates quarreled about talks with world powers over the country’s disputed nuclear program Friday as they held their final televised debate ahead of next week’s election.